Sorry if this is OT but I just had to tell someone. I'm a huge fan of CRT TV's. I still prefer them with my older consoles. But, they are getting hard to find. Whenever I see a small one that is cheap, I usually snag it. A while back, I found TWO Sony PVM's for $15 each at Goodwill. However, I didn't buy them!!!! I have no idea why I didn't. I'm kicking myself for it. I could have sold one and paid for both. 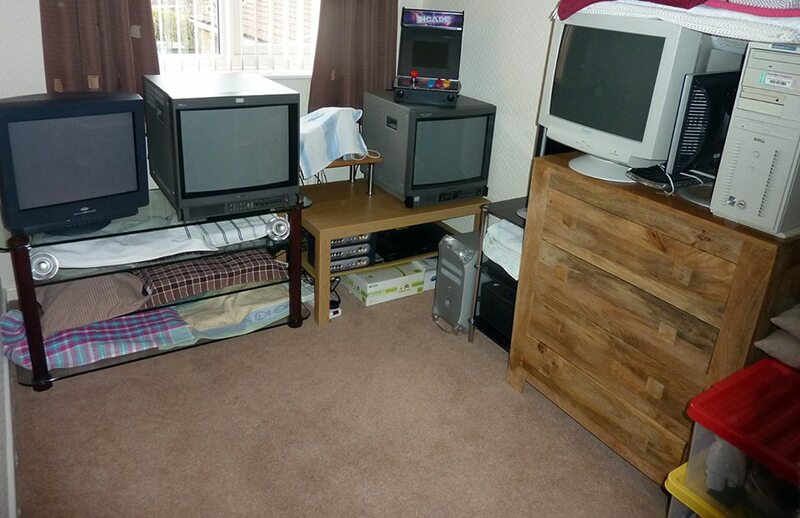 A few months later I found yet another TWO CRT TV's. This time, they were normal CRT's. Except for one thing. They had to be 40" or more!! I kid you not. The most gigantic CRT's I've ever seen and they were NOT the projection kind. I didn't buy them because I literally could not lift them. Plus, would have nowhere to put them. Then came yesterday. I found another large (maybe 32") CRT from Sony. This one had an odd, curved shape to it. The screen was maybe 32" but the housing was much larger. But what really caught my eye was that it had TWO HDMI ports!!!! I didn't know any CRT TV supported HDMI. I really thought about getting it but again, no place to keep such a large TV. Have you had any odd CRT spottings? In our part of town it's a virtual put your dead out all summer long. I honestly don't know where they come from. But, they are getting hard to find. Can't give them away in my area and the garbage man waste management professional won't take them. You have to pay to get rid of them. There's currently about 20 on my local CL and another 35+ on Facebook marketplace for FREE. Hundreds more that people want money for but will eventually end up free. My buddy disposes of them by breaking them into smaller pieces and puts it in the regular garbage. Don't worry about the pollution or environmental damage. It's like 1 billionth of what a Fortune 500 co. generates in an afternoon. My area is notoriously bad at CL and thrift stores. If I see 1-2 CRT's in a month (and I go almost every day), then that's high. I used to see them all the time a year or so ago. Only collectors and vintage game players like me want them. Which is a shame. Wow...passing up Sony PVMs? Insanity!...I would loooove to find one in the wild. And I looooove CRTs. Deal with it. Ya it all depends on your area. It took me several months for me to track down my 36" set with component inputs. Took until after Christmas with People getting new TVs as gifts. If I stumbled across 2 PVMs and a 40 incher, they would all be coming home with me. My area is notoriously bad at CL and thrift stores. One of the thrift shops around here has an e-recycling bin located in the parking lot in front of the store. It is usually full of CRT TVs; I have no idea about the rules for taking one (or more) from the bin -- I don't have a car nor do I need (another) old TV. In terms of the thrift shops themselves, I have not seen a CRT TV (or computer monitor) for sale in several years. There are two recyclers in my area. One give "e-waste" to Goodwill. Goodwill will pick-n-choose what they want and sell the rest as scrap. The other just sells the e-waste to a smelter which ticks me off. I found a Sega Genesis in there one time. The guy that runs it thinks everything with a plug is a "hard drive". Me: "Can I pay for that Sega Genesis? I will give you more than the smelters." Him: "No, all hard drives have to be destroyed because they contain social security numbers on them." In New Jersey many thrift stores will no longer take CRT TVs and most places require you to pay money to take them. I've seen them dumped on the side of the road or in the woods because people do not know what to do with them. 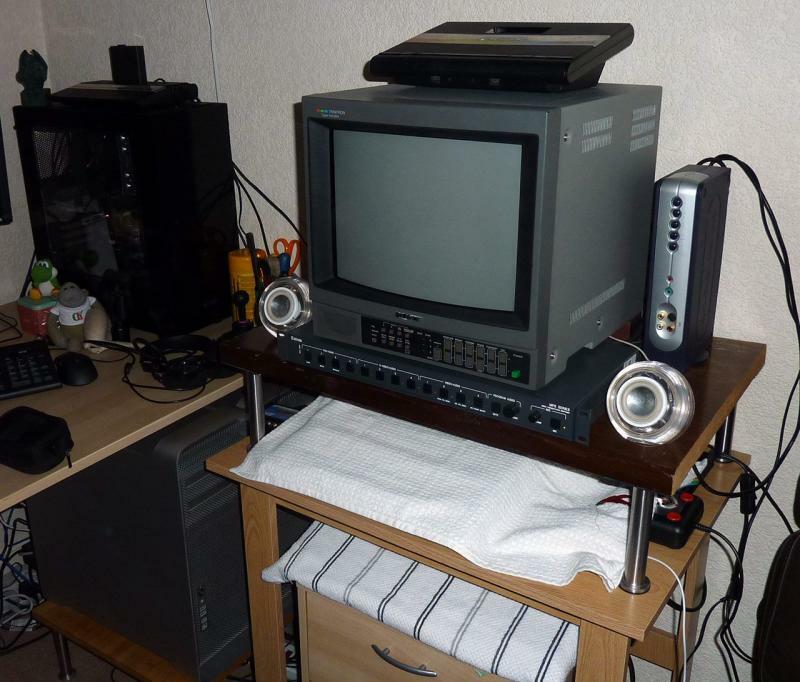 Best CRT I ever owned was a hulking 100lb Samsung HD (1080i) CRT that I gave to a friend when I first got a flat screen. I believe the CRT was rated at 36 inches. I could carry it back then, don't know if I could now. I put thirty+ hardcover Pathfinder sourcebooks into a container to be recycled the other day and I couldn't carry it for more than ten feet a time without putting it down to rest. Middle age is the pits! Edited by rpiguy9907, Fri Jan 18, 2019 3:08 PM. I can still carry a 21" on my own, but won't risk anything above that. I usually just ask the seller or cabbie to help me out for a small fee. Once I just hired a man-and-van to do it all, because the set was amazing and cheap so it was worth it. This summer I bought one big 27 Trinitron and one 21" from an ad and the seller was so happy to be getting rid of them that he took his buddy and carried it all in for me to the 2nd floor. They will naturally get more and more scarce over the next decade, plus there are some CRT scalpers now too, thanks to the hyping up of this hobby, so all you cathode ray freaks better stock up now! I know I have. Recycling Pathfinder? I would have thought it would be easy to donate that stuff to some gamers. Is it really that far gone these days, or just obsolete printings? Im still in the hunt for a really great CRT...I have three but not one the ONE...needs to be large, in great shape and the picture needs to be top notch. Hard to do unless you're dealing with a hobbyist, and their stuff isnt cheap. Edited by atarilovesyou, Sun Jan 20, 2019 12:03 PM. The Parhfinder books were recycled by taking them to the local used book store to hopefully be passed on to someone who has more time to play. Im still in the hunt for a really great CRT...I have three but not one the ONE...needs to be large, in great shape and the picture needs to be top notch. I had an obsessive phase like that for a moment but luckily managed to get over it. There's no such thing as a "perfect" TV...you will always manage to find some flaw if you look hard enough. But the thing is, most of them don't really matter once you start actually playing the games. This is why I avoid places like r/crtgaming or the system11 board because most of folks there are just diving into a CRT-shaped rabbit hole with their worship of PVMs and only particular brands/series/models of consumers TVs. There is no perfect TV... IMO, because some TVs are better with a generation of system than other. I have several TVs because I have the luck to have room to store a few. A smallish, 36cm or 51 cm TV is more than enough to play most 8 bits era system; with the 51cm, 16 bits system will be big enough, unless you play in a gigantic room I suppose. A 51, 55 or 70cm TV will do justice to 32/64 bits era systems and 128 bits. Althoguh for the 128 bits one, you mgiht like the most modern TV, with component imputs and being a 16/9, and ideally supporting 480p. 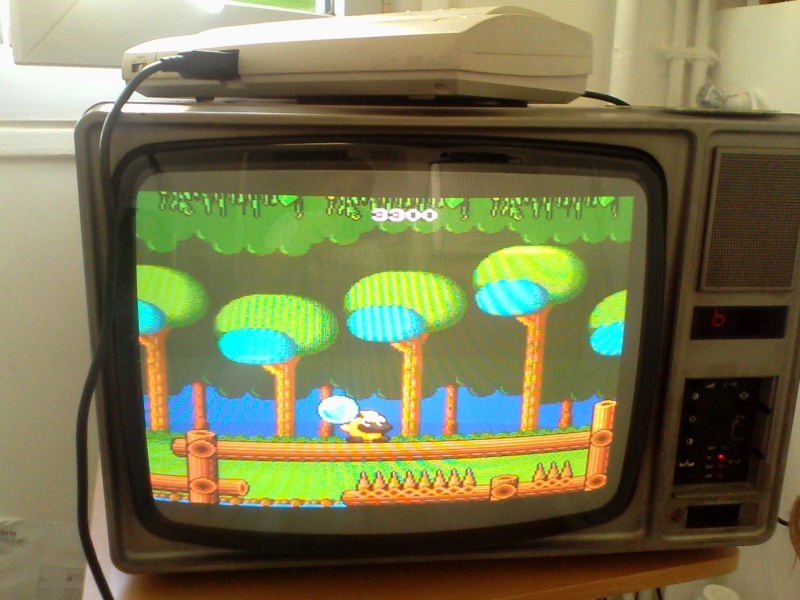 I found out that 80's TV with their totally analog input do wonder to display our old systems; the downside is that due to lower tech and/or age, the picture isn't as crisp and you have to accept the rounded screen. A more modern TV usually have a better defined screen but on late models, there is digital even on analog input, which can induce some lag, picture smoothness due to filters, and msot of the time you can forget about RF input. So, no there isn't one "cover all cases" display. I have a 37" Sony. They did make them big. It weighs 180 pounds.All those stories about kids being crushed by TVs? Hell, this one could crush a full grown adult. Summer 1986. We were hitting the area pawn shops looking for a small color set. I was crossing a street to the next shop, when a guy carrying a Sears 12" color TV was walking out, along with his two pals. I asked if he'd just bought it and he answered he had gotten it out of pawn. I then aked if he wanted to sell it for $60 cash. They all looked at one another and the deal was struck in the midde of the street! Since then, it's seen heavy use with computers and as a second or third TV. It spent many of those years in our dusty workshop. I've certainly had far worse luck with later CRT sets purchased new. The only "repairs" have been blowing the dust out, perhaps opening it up for control and tuner cleanings. Maybe once a decade, or as needed. CRT TVs and monitors still far outnumber flatscreens here, expecially if you peek into my shed. I'm all set for awhile yet! Edited by Ed in SoDak, Thu Mar 14, 2019 11:57 PM. Does that PC+monitor work? Can you play DOS games on it? Indeed it does, and you can. I'll see if I get a chance to set it up in the next couple of days and take a few snaps. But yeah, from what I remember from when I last used it, the can lines are much less apparent than on an 15khz CRT.